Mario vs. Donkey Kong artwork of Mario doing a Handstand Double Jump. The Handstand is a special move that Mario uses in Donkey Kong and Mario vs. Donkey Kong. Mario can use this move to perform a Handstand Jump and, when timed upon landing, a Handstand Double Jump to easily get to high places. 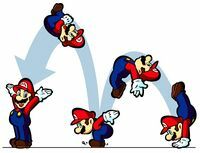 Mario can also use a Handstand Walk to travel slowly on his hands. Both the Handstand and Handstand Walk have the effect of harmlessly deflecting certain overhead hazards, such as Nitpicker eggs and Brickman bricks. In Donkey Kong 64 the OrangStand is a handstand mastered by Lanky Kong and learned from one of Cranky Kongs potions. OrangStand Sprint, his barrel move, also includes him using a handstand, but at high speed. In Paper Mario: The Thousand-Year Door, Koops can do a spinning handstand as a Stylish Move. It can only be done by doing Power Shell or Shell Slam; the player must press within 0.2 of a second when Koops returns to his original position after doing Power Shell or Shell Slam. When Koops spins for 1-2 seconds and the player presses , he will do a pose. This Stylish Move is done to earn a quarter to half of a full circle of a Star Power. Mario doing a handstand underneath a Brickman in Mario vs. Donkey Kong. Koops doing the spinning handstand Stylish Move in Paper Mario: The Thousand-Year Door. This page was last edited on December 17, 2018, at 00:19.